At a Glance: 350+ milligrams B-complex vitamins Free-form amino acids Botanical extracts Fruit and vegetable phytocomplex Digestive enzymes Active ingredients: 75 Milligrams of amino acid blend: 800 Milligrams of phyto blend: 240 Milligrams of viri blend: 525 Vitamins, minerals, and other essential nutrients are the body’s fundamental building blocks. They support a strong foundation and are responsible for our energy levels, performance, and vitality. 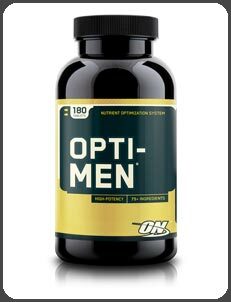 Optimum Nutrition designed Opti-Men as a complete nutrient optimization system. By packing over 75 active ingredients into one pill, ON has created much more than a multivitamin. Optimum Nutrition Opti-Men Men’s Multivitamins, 180 count.